If you take a children’s story and make it too adult for its original target audience, who is going to want to watch it? 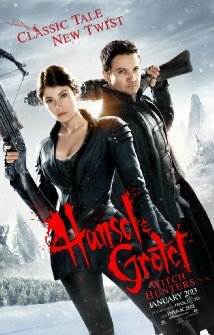 Hansel & Gretel: Witch Hunters is much too violent (and a little too sexual) for the kids who care about the classic story. At the same time, the whole basic plot idea – orphaned kids who are trapped by a witch in a candy house – is a little too simplistic and ridiculous for adults to take at all seriously. However, in recent years since the surprise popularity of The Lord of the Rings, adult takes on classic children’s tales have become standard operating procedure for Hollywood. There have been a few Snow White retellings. Tim Burton re-imagined a young adult Alice in Wonderland. A newfangled “Jack and the Beanstalk” (aggressively rechristened Jack the Giant Killer) recently slipped in and out of theaters. So did Oz: The Great and Powerful. None of them have been big hits (though Snow White and the Huntsman did fairly well), but Hollywood isn’t ready to give up on the genre yet. Hansel & Gretel: Witch Hunters should kill the whole movement, but it probably won’t. It certainly was a box-office disappointment and a critical whipping boy, but apparently it is still being set up for a sequel. And, frankly, Hansel and Gretel’s double-entendre-laced banter seems a little creepy for characters who are supposed to be brother and sister. Tags: Alea Sophia Boudodimos, Bjørn Sundquist, Cedric Eich, Dante Harper, Derek Mears, famke janssen, Gemma Arterton, Hansel & Gretel, Ingrid Bolsø Berdal, Jeremy Renner, Joanna Kulig, Kathrin Kühnel, movie review, Peter Stormare, Pihla Viitala, PopEntertainment.com, Rainer Bock, Robin Atkin Downes, Thomas Mann, Thomas Scharff, Tommy Wirkola, Witch Hunters. Bookmark the permalink.